The Penguins were looking to put Thursday's 3-0 loss to New Jersey behind them and show that the goose egg they laid against rookie Scott Wedgewood was nothing more than a fluke occurrence. They certainly put those concerns to net, chasing Petr Mrazek from the net while taking the game to a Detroit team desperate to gain traction in the playoff race, beating the Red Wings 7-2. Phil Kessel and Nick Bonino both scored a goal and added 4 assists to lead the high-powered Pittsburgh offense, while Marc-Andre Fleury wasn't tested much in stopping 21 of 23 shots. The Penguins started off the game with good pressure early in the 1st period. Sidney Crosby found Chris Kunitz between the circles during the opening minute, but Kunitz inexplicably passed the puck back to Crosby in the right circle with no shot instead of putting the shot on net. Gustav Nyquist nearly made it 1-0 Detroit off a rebound with Fleury down, but Trevor Daley was able to tie up the Red Wing and prevent him from getting a stick on the puck and putting it into the empty net. Brian Dumoulin would leave the game early in the period with a bloody nose after being hit awkwardly into the boards by Justin Abdelkader, but no penalty would be called on the play. Dumoulin would momentarily return later in the 1st period, but he would ultimately miss the rest of the game. The Pens would continue to play with 5 defensemen, and it would cost them on a sloppy change midway through the 1st period. There was confusion over who was going on with Ian Cole coming off the ice, and Brad Richards was able to hit Andreas Athanasiou behind Ben Lovejoy to spring him on the breakaway, with Athanasiou beating Marc-Andre Fleury low to open the scoring. The teams would play 4-on-4 moments later when Patric Hornqvist and Danny DeKeyser got into a post-whistle scrum in front of the Detroit net, but neither team was able to get much going despite the extra space on the ice. The teams would continue to play each other close throughout the 1st period until Henrik Zetterberg drew a holding call against Carl Hagelin by clamping down on his stick entering the Pittsburgh zone to send the Red Wings to the power play. 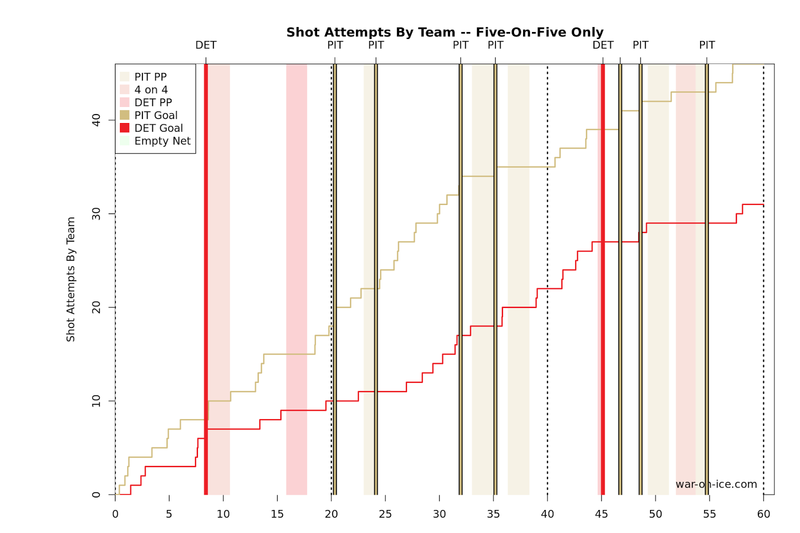 While the Penguins' own power play has been misfiring in recent games, their penalty has done a decent job of picking up the slack, and the PK was able to kill off the Detroit advantage without much difficulty. Justin Schultz would get a great opportunity in the slot shortly after the Detroit power play expired, but Petr Mrazek would get his left pad on the puck to prevent Schultz from evening the score. The teams would exit the ice for the first intermission with the score remaining 1-0 Red Wings, continuing the goal scoring slump for the Penguins offense, but it wouldn't take long into the 2nd period for the Penguins to get off the schneid. Kris Letang missed the shot wide, and the shot bounced off the boards to Chris kunitz, who was able to bank the rebound in off Mrazek and into the net to tie the game 1-1. Minutes later Pavel Datsyuk was sent off for hooking Sidney Crosby, and the Penguins' were able to get their struggling man advantage back on the scoresheet. Letang skated the puck down to the right faceoff dot and picked the bottom left corner of the net to increase the Pittsburgh lead to 2-1 on his career high 15th goal of the season. The quick pair of goals would not only give the Pens the lead, but it would also open up the game play to a pace more of their liking, and play continued to go back and forth through much of the 2nd period with Pittsburgh steadily building on their lead in possession. The dominance in possession would eventually turn into another goal on the board. Carl Hagelin won a board battle behind the Detroit net, and he curled around at the red faceoff dot to wrist a shot that beat Mrazek glove side to increase the Pens' lead to 3-1. Abdelkader would get called for tripping Lovejoy when he bodyslammed the Pens defenseman to the ice in front of the Pittsburgh net, and the resulting power play presented a chance for the Penguins to potentially blow the game wide open if they could score. But it was the Red Wings who were getting the prime chances early, first when Fleury stopped a Darren Helm shot and a Luke Glendening follow up on the rebound in quick succession on a 2-on-1 Detroit rush, then stood tall as Riley Sheahan missed the net after taking a pass from Athanasiou on another Red Wings 2-on-1. They would kill off the Pens advantage, but seconds later Kessel would wrist the shot past Mrazek from the right faceoff dot, sniping the same bottom left corner that Letang hit for Pittsburgh's 3rd goal of the game from that spot on the ice. That would be enough for Detroit coach Jeff Blashill to pull Mrazek in favor of Jimmy Howard. The Penguins would lose another player late in the 2nd period when Datsyuk gave Chris Kunitz a shoulder up high, with Kunitz needing help to get back to the bench. The refs would call Datsyuk for interference, but Pittsburgh couldn't make them pay, and the period ended with Pittsburgh holding a commanding 4-1 lead. The Red Wings would need to get things going early to get back into the game, but it was Bryan Rust who nearly extended the Pittsburgh lead when he got in behind the defense early in the 3rd period, but he wasn't able to beat Howard. Tom Kuhnhackl nearly scored himself minutes later when Rust got him the pass in alone on the crease against Howard, but Kuhnhackl's shot rang off the crossbar and deflected out of play. Despite the chances, the lead would remain at 3, and the Red Wings would have a great chance to cut into the lead when Nick Bonino was sent off for tripping Nyquist 5 minutes into the period. And the Red Wings would get the goal on a fortunate bounce off a Mike Green one-timer. Matt Cullen would get a stick on the shot, and it would deflect off of Ian Cole and change direction again before fluttering past Fleury to make it 4-2 Pittsburgh. But Bonino would quickly atone for his penalty when he grabbed a loose puck in the neutral zone and took it to the Detroit net. He wasn't able to get it past Howard, but the puck remained loose in the crease before Eric Fehr was able to poke it in and restore the three goal Pittsburgh lead. Moments later, Kessel and Hagelin would come down the ice on a 2-on-1 rush, and Kessel saucered a perfect pass that Hagelin was able to one time past Howard to make it 6-2 Penguins. As if that wasn't enough, later in the period Kessel would find Bonino with a cross ice pass on the rush, and Bonino would beat Howard glove high to give each player 5 points on the afternoon to make it 7-2 Pittsburgh. The Penguins opened the game with an early advantage in possession, and they continued to build upon that throughout the game as they finished with a score-adjusted 63.2 CF% against the Red Wings. Putting up big margins in the possession game is nothing new for Pittsburgh, and they've posted the higher SACF% in 11 straight games now, with just one of those games falling below 52% and just two below 54%. The win pulls the Penguins within 2 points of the Rangers for 2nd place in the Metropolitan Division pending the result of New York's game later today, and Pittsburgh will look to further close the gap when they travel to New York to take on the Rangers tomorrow night.